EBM and new beat music were the fierce sounds that defined Germany and Belgium's electronic ethos for the better part of a decade. Now, the genre has become a nostalgic reminder of electronic music’s formative experience in Europe prior to the international blossom of techno and house in the ‘90s. Having recently documented the alarming rise of electro in 2017, Mixmag now takes a look at the genre’s closely related cousins: the gothic and foreboding EBM (Electronic Body Music) and its kinetic and mischievous offspring - new beat music. Originally used by Ralf Hütter of Kraftwerk to explain the sound of the band's 1978 album ‘The Man Machine’, the term "electronic body music" was adopted by the formative Belgian group Front 242 in 1985 to categorise the group’s danceable electronic punk - creating a distinct adjunct of Europe’s new wave/post-punk movement that focused heavily on synthesisers. As legend has it, a Belgian named DJ Dikke Ronny (Fat Ronny) played the EBM track ‘Flesh’ by A Split Second at a nightclub in Brussels one night when he "accidentally" slowed the record's roll from 45rpm to 33rpm. Finding an unforeseen moment of infectious movement, the major underground success known as new beat music was born. The popular genre was a nascent combination of Belgium’s beloved EBM and the growing flood of house and acid music coming from Chicago in the late ‘80s. Through the lens of recent techno and electro trends, the sharp and classic sounds of these two genres tend to make a remarkable impact on modern dancefloors. Wrathful as it is deliciously dated, the music helps you embrace the angsty attitude of your inner techno-punk. 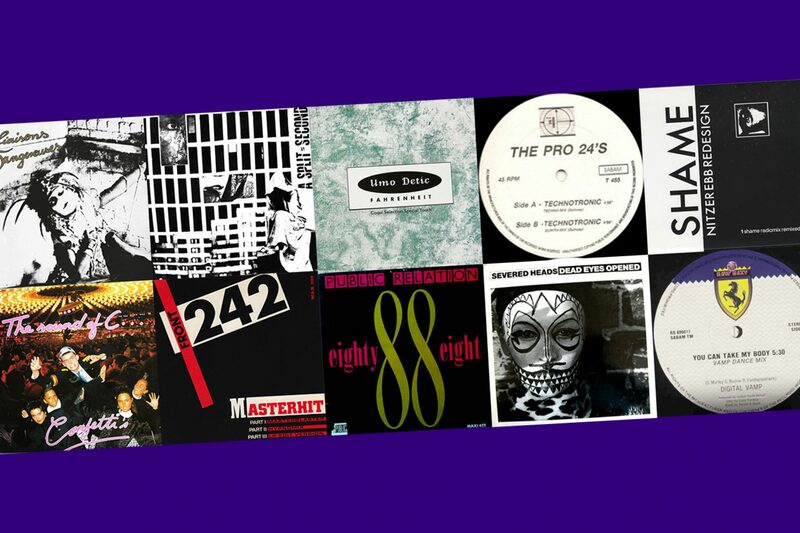 We've picked out 10 essential pre-90s EBM and new beat tracks to soundtrack your raging mood. Straight out of Dusseldorf, Liasons Dangereuses’ exclusive 1981 self-titled album is undoubtedly one of EBM’s most crucial compositions. Making its way abroad, tracks such as ‘Los Ninos Del Parque’ off the German trio’s album turned into an essential offshore inspiration for budding electronic producers in both Detroit and Chicago. The stark acceleration of the electro melody and bursting lyrics on ‘Etre Assis Ou Danset’ make for a stimulating experience that can get you moving in ways you've never really considered. Not all lauded EBM groups came out of Germany and Belgium. Long time friends of Depeche Mode, the English duo Nitzer Ebb from Essex got their start at the wildly young age of 15. Without no band backing them, Nitzer Ebb relied on hyper lyricism, heavy drums and their knack for techno programing to give their sound the edge it needed. Released on their 1989 album ‘Belief’, the track ‘Shame’ is a perfect example of this badass and brutal technique. Originally known as Mr. and Mrs. No Smoking Sign, the Sydney-based duo Severed Heads got their big break in 1984 thanks to the trio's lead-single ‘Dead Eyes Opened’. Using a foreboding vocal monologue from the ‘60s TV show Scales of Justice, the soft, dauntless and busy nuance of the track ended up landing the experimental duo in a position of widespread prominence. It's popularity resulted in a re-vamped 1994 version of the original track which would help it fit in easily with the dancefloors of the time, but the hushed down and dusty emittance of this digitally restored U-Matic tape recording is way more hip. The first to introduce the term EBM as it applies today, Front 242’s dark and clunky sound lead the steady, industrial tone of Europe’s devilish angst of the ‘80s. Lead by explicit lyrics, constricting drums and square basslines, Front 242 nails down a dynamic sound that can make even the most posh and preppy individuals want to dye their hair and paint their lips black. The EBM track that inadvertently gave birth to the new beat scene after being slowed down to 33rpm, ‘Flesh’ by the Belgian electronic duo A Split Second is the crossroads of the two Belgian-based genres. A song frozen in time, ‘Flesh’ could also just as easily be mistaken for an OG Detroit techno track. Originally created as part of a marketing campaign for the nightclub Confetti’s in Brasschaat, Belgium, ‘The Sound Of C’ would inadvertently become new beat’s most beloved ambassador. Using a few guerrilla marketing tactics to get their campaign off the ground, Confetti’s dropped its frontman Peter Renkens (the nightclub’s former bartender) into the middle of a busy shopping square in Antwerp to shake things up a bit. Dressed up as a flashy traffic cop, Renkens and a mob of smiley agitators stopped vehicles in the street and caused a public ruckus with their dance moves for the track’s music video. The hype worked and the sound stuck. Recognized today as one of the world’s most valued independent music labels, R&S Records was founded in 1984 in the city of Ghent, Belgium. Inspired by his country’s new beat movement, Renaat Vandepapeliere and Sabine Maes created R&S records (the couple’s initials) to do two things: to explore new sounds and give artists from Belgium a chance to license and release their own music. When asked about how the opportunity to start his label came about in an interview with Clash Magazine, Vandepapeliere responded “It was new beat that gave me the chance.” Public Relation’s ‘Eighty Eight’ - the eighth record ever released on R&S - gave way to a driving and newfangled underground direction that would help Belgium’s sound fly across borders - both physical and sonic. *An important note regarding the song title: the number 88 is often referred to as a "racist number" that is used by Neo-Nazis as an abbreviation for Heil Hitler. Despite the fact that an unfortunate amount of industrial music has been co-opted by racist groups and individuals, Public Relation has no white supremacy leanings and the the track title simply refers to the year of its release (1988). Before Technotronic became a global sensation for their hit track ‘Pump Up The Jam’, the Belgian music project originally released the track as and instrumental as The Pro-24's; later taking the track's name and adopting it as their moniker. A true testament to Belgium’s new beat scene, ‘Pump Up The Jam’ has gone quadruple platinum and continues to live up to its name when thrown on at most any party. Despite the revamped versions pop-genius, the original features Eddie Murphy vocal samples and has enough reverence to get crowds moving equally as hard. An official side project of the group Bigod 20, Umo Detic consists of the German EBM titan Andreas Tomalla and Perlon Records co-founder Markus Nikolai. Despite having only made two tracks during the time as collaborators (‘Fahrenheit 1989’ and ‘Carpe Diem’) Umo Detic’s enjoyable and arbitrary sample bank atop its solid drum-machine foundation turned both tracks into alternative dancefloor knockouts in the US and beyond. Put together by producers Gaetan Bouvie, Cisco Ferreira (aka The Advent) and R&S Records founder Renaat Vandepapeliere, this momentary collaboration known as Digital Vamp came together for a blip in time - only to create a wondrous new beat dancefloor banger that has aged like fine wine. Throw a siren noise over this one and get the party to its capacity.